Today, I gave a webinar for SirsiDynix on developing an online first mentality for library website content. You might remember that I wrote about creating an online first mentality earlier this year. Here are my slides from the webinar – enjoy! 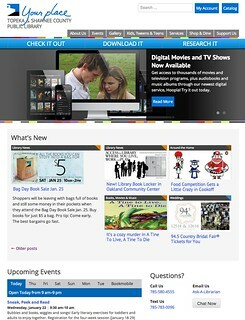 Well, I didn’t really post much about my library’s website redesign. But next week, we go live with it! You can check it out now at our beta, pre-launch URL – dev.tscpl.org. Then, we’ll continue to tweak things as we notice them for 2-4 weeks. Sometime after the big launch, we plan to have Influx take a peek, to catch stuff we missed. Finally, we plan to do some usability testing to catch even MORE stuff we missed. We went responsive, so one set of code works on all browsers and devices. And probably much more that I’m missing. So go check it out! I recently presented this talk at Internet Librarian 2014, and wanted to share it here too! If you want to see some really good notes from my presentation, check out Sarah Houghton’s post (thanks, Sarah!). 1. Mobile-first design. Start designing on the small screen, then widen out to tablets and desktops. If you canâ€™t do it on a mobile device, you probably donâ€™t need it on your â€œbigâ€ website, either. 2. Responsive. Use a responsive or adaptive design, so your website works great on all screen sizes. 3.Simplicity. Many web designs are going for a more minimalistic, simplified look. Make sure the design doesnâ€™t get in the way of, or overpower, your great content. 4. White Space. Goes along with simplicity. White space can help emphasize content. Use it just like they do it magazines. 5. No Flash. Websites are still working on moving away from Flash and towards more modern design languages like HTML5 and CSS3. 6. Parallax. Parallax design is a way to provide design depth and almost a 3D look to your website. IT reminds me of layers in Photoshop â€¦ just done on websites. 7. Flat Design. Sorta funny. Flat design and parallax design are almost opposites (but not quite). Flat design focuses on clean design and good use of color and whitespace. Think the new iOS design, and youâ€™ll get the idea. 8. Blocking. Blocks of content – think Pinterest. I think it works great on sites like Pinterest or Flickr, where thereâ€™s a ton of content and the content is all on equal footing. On library websites like New York Public Libraryâ€™s main page? Not so much. Iâ€™d guess their content is NOT equal in terms of importance, and the bottom of the page looks like an afterthought, like they forgot to â€œfinishâ€ the website. 9. Big Images. Use of large images on websites is a trend at the moment – even having a large image in the background of a website. 10. Colors. Using colors is big, apparently. Depending on what â€œhot web trends for 2014â€ you read, youâ€™ll get a variety of answers as to what colors are trending – subtle and calm colors, retro colors, even neon colors! But know that web design is â€œcolorfulâ€ these days. So think about using a tool like Adobe Kuler to help choose popular colors for a website. Or just go to Home Depot and get some matching paint swatches, and use those as a color base for your website. 11. Web Fonts. Weâ€™re no longer limited to a couple of web-safe fonts. Think about using new web fonts like Google Fonts or Typekit. 12. Video. Video is still growing in importance.Â A recent Pew report on online video says that 78% of online adults now watch or download video content. Itâ€™s an easy way to provide viewable content on your website. 13. Social Media. Social media integration is important for all types of websites and organizations. Itâ€™s a great way to share content out to customers in all the online â€œplacesâ€ they hang out at. 14. Large Buttons. Websites are starting to use large, easily seen buttons. Make them big and bold! 15. Vertical Scrolling. Think about using â€œstickyâ€ navigation that glues itself to the top of the page, or social media sharing plugins that glue themselves to the side of a page. There you go! 15 web design trends for 2014. Are you redesigning your website? We are! Please share your new design ideas!